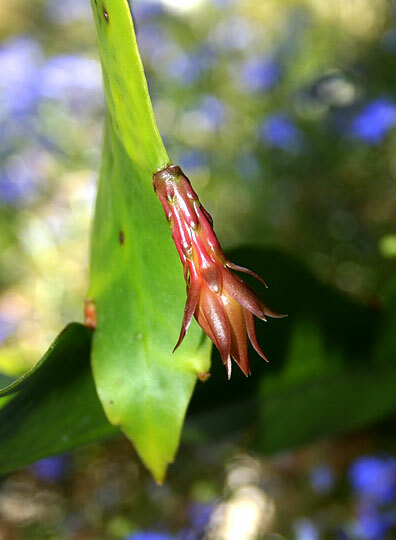 The epyphyllum plant has entered a growth phase of unprecedented vigor and activity, pushing out new leaves, two new stems (that will eventually support leaves) and many new buds. The leaves are a welcome sight, because the more new ones the plant gets, the less guilty we will feel about pruning away the old, terribly ratty leaves. The picture below shows a mottled older leaf beneath a nice, shiny and green new leaf. Here is one of the new stems. Growing furiously, it is at present over 27" long. Finally, one of the many new buds covering the plant. Most of these new growths fail to progress beyond the size shown. 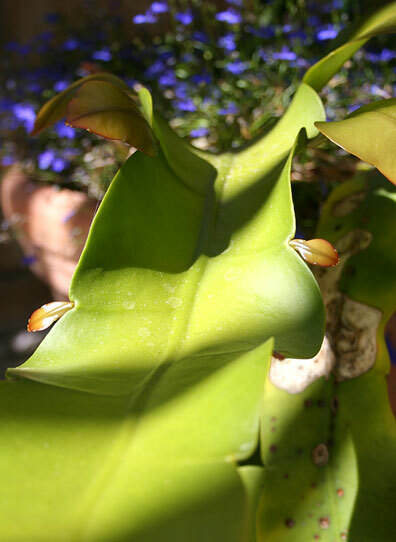 Typically, if they survive to the size shown in the second picture below, they'll culminate in a bloom. Hello from Marion, OH. Last night I got to experience the first bloom on my night blooming cereus! I'm so glad to have found your site so I knew what to watch for as the bud developed. What an incredible display! jzlcI am looking for pruning advice. It seems you have had some luck. I have seen my great grandfather's cioffed to artful sideways growth with lots of blooms ready to go. Alas that was 100 years ago and the knowledge has been lost to the generations. though not the plant. My plants are offspring of that plant. I'm MAD with envy of your pictures! 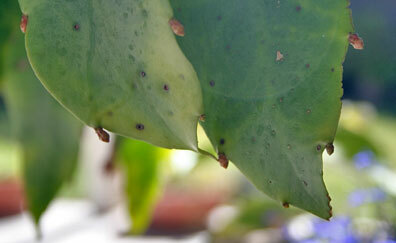 All of them, but especially the crystalline focus and wonderful color of the cereus closeups. I wish you would tell more of how you took them. I have a plant that grew from the gift of one 'leaf' four years ago. 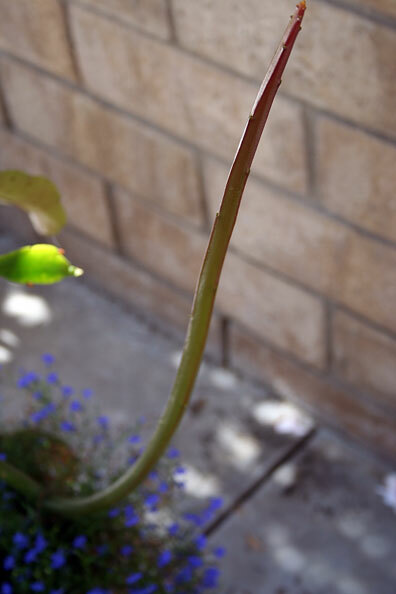 I have high hopes that it will bloom as those in the photos. It is supposed to be the 'nightblooming' variety. A month ago one of my 'orchid cactus' bloomed for the first time & it was magnificent. A fuchsia colour with 4 blooms that lasted for days.